Snow capped peaks, flower-filled mountains and crystal lakes are the essence of camping in the French Alps -one of the world’s most spectacular outdoor playgrounds. 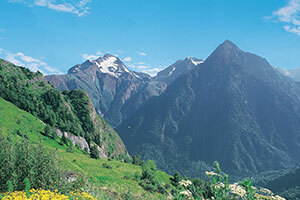 Activities on offer include hiking, climbing, skiing and mountain biking. If you are looking for a more relaxing break, just soak up the stunning views – our campsites in the French Alps are surrounded by some of the most beautiful scenery in Europe. Grenoble Surrounded on all sides by the Alps This is a city with a reputation for technology and science, but modern structures stand side by side with medieval buildings. Its cable car system-the Teleferique – was one of the first in the world, and takes you up to the Fort of the Bastille. It explains about the soldiers who were based here and the battles they undertook in the mountains. Annecy The ‘little Venice of the Alps’ is a charming town set on the clear blue lake of Lac d’Annecy. In the old quarter flower-lined canals flow between quaint old buildings, incuding the much-photgraphed Palais d'Isle, a prison which dates from the 12th century. The town is built on the northern end of Lac d'Annecy which has a number of attractive beaches and boat moorings. Aix les Bains Famed for its thermal springs, this fashionable spa town retains a few remnants of its Roman past and a legacy of splendid buildings from the Belle-Époque: there’s even a statue of Queen Victoria. Don’t miss the Sewing Museum, and the Faure Museum with its fine collection of Impressionist paintings and Rodin sculptures.Visit the aquarium on the banks of the Lac de Bourget - the largest natural lake in France – take a boat trip to Hautecombe Abbey, or drink in the panoramic views from the top of Mount Revard. Parc National des Ecrins The largest French National Park is a remarkable area with beautiful wild and rugged landscapes. Chamomix Site of the first Winter Olympics is situated in a valley at the junction of France, Italy and Switzerland. The world’s highest cable car gives you a hair-raising trip to the Aiguille du Midi and a breathtaking view. CERN The world’s largest particle physics lab is just over the Swiss border. There are two permanent exhibitions, and guided tours are also available.To plan your perfect French Alps camping holiday, just use our interactive campsite finder, call our knowledgeable Sales team on 01 242 1901.